MORE than 1000 homeless and vulnerable people received emergency assistance from St Vincent de Paul volunteers in Annerley last year. The volunteers work to ensure that there is no one in the area who is without – at the bare minimum – food and water. One of Vinnies’ major initiatives is to help their client’s secure safe and affordable housing – sometimes for a single resident, but often Vinnies assist with relocating families – often as a result of domestic violence. Those who do secure safe and affordable accommodation face a different predicament. Frank Ford is a veteran volunteer and president of Vinnies Annerley and is unhappy with low-income housing prices. 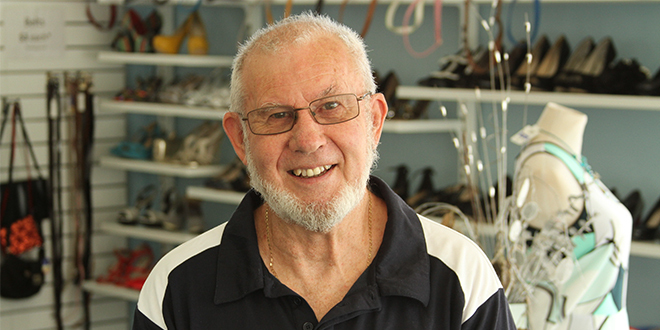 “Volunteer members make a significant difference in the lives of people doing it tough in Annerley,” Mr Ford (pictured) said. “We deal a lot with housing because there are a lot of people in this area living in very expensive accommodation where it costs around three quarters of their income to live there so they’re really struggling. “People want to live close to the hospitals and there are a lot of boarding houses around here so we provide support to them as well. “Volunteer members in Annerley helped 1,188 people doing it tough last year – and we’re calling on more people to join us to help people in need in 2019. “When you become a volunteer you help people who are struggling in this area. “It’s really nice to feel like you’re making a difference in other people’s lives. Annerley volunteer Janet Murray said she found her volunteer work helping people in need rewarding. “I love volunteering, I think there are a lot of inequalities in society and I just think I would want someone to help me if I was in that position,” she said. “We helped a refugee mother who is widowed and has two young sons, she was trying to find a job to support them but she was struggling so we have been supporting her. “We gave her sons things like soccer balls for some recreational activity and we support her and help her out with food and just being an ear to listen to her troubles. Annerley is a part of Vinnies’ Brisbane region which assisted more than 42,400 people in 2018, of those assisted 15,850 were children under the age of 16.